Jersey Scottish have a "toehold" on the title race after their 3-2 win over rivals St Paul's, according to manager Pat Brennan. 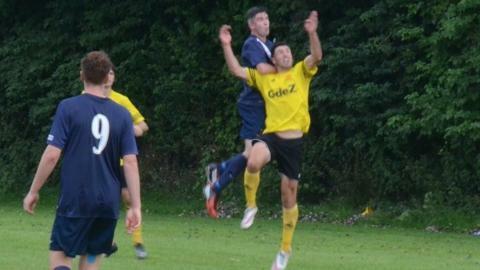 Daryl Wilson netted twice for Scottish as last season's runners-up the beat reigning champions at Clos des Pauvres. "The evidence of the last few years is that it's either going to be Scottish or St Paul's that are going to win the league," Brennan told BBC Radio Jersey. "Whoever gets that first result usually had a bit of a toehold on it." Jersey Scottish and St Paul's have won every Jersey Football Combination title bar one since 2004, with the St Peter's win in 2006 the only time a club other than them have lifted the James Marquis Memorial Trophy. Wilson's early goal and Max Thompson's strike saw the Scots 2-0 up at the break, before Craig Russell pulled one back. Wilson made it 3-1 before Russell's looping header made for a tense finale. It means St Paul's are still searching for their first league win, following their 2-2 draw with Jersey Wanderers on Thursday. "Last year we were chasing St Paul's and now they've dropped two points against Wanderers and three points here," added Brennan. "It's a hard thing to come back and catch up if there's the same consistency in the two teams." But Saints boss Paul Brannan says the league is by no means lost yet. "This does leave the league very much open, but we're talking about the second game," Brannan said. "Nothing's won or lost in the first week. There's a long way to go and we just look forward to the next challenge that comes." In the day's other games, St Ouen thrashed First Tower United 6-0, helped by Rupert Murray's hat-trick, while Jersey Wanderers and Trinity drew 2-2. Bradley Russell's stoppage-time penalty gave Grouville a 2-1 win over St Brelade, St Clement beat Portuguese 1-0 and Rozel Rovers were 2-0 winners against Beeches.